Investing in the best ETFs in tech is a safe and simple way to make more money today. The great thing about any exchange-traded fund (ETF) is that it affords you a lot of potential upside while also greatly diversifying away your risk. Also, tech ETFs are as liquid as any stock, and they come with much lower expenses than mutual funds. You'll never pay a penalty for trading out of a tech ETF. 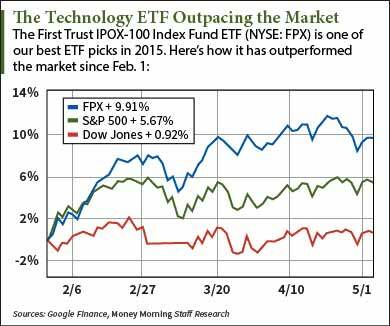 But best of all, because tech ETFs are "focused," they offer pin-point exposure to any technology sector or niche or trend. For example, one of the best ETFs in tech gives you a cheap way to play the boom in tech IPOs. Last year IPO volume soared to $257.7 billion, and 2015 is shaping up to at least equal that record year. What investor wouldn't line up for a slice of a pie that size? However, the pitfalls of playing the IPO market are only too well known. They are overly risky… they can be overly expensive… and worst of all…IPOs frequently exclude the small investor. Another drawback to IPO investing is that for most new issues, the first six months of trading is extremely volatile. But now – because of top tech ETFs – individual investors have an easy "backdoor" way to capture tech IPO profits with all the ease of buying a share of stock. That's why Money Morning's resident tech expert, Michael Robinson, considers this IPO play one of the best ETFs to buy today. It's one that every investor should consider holding for the long haul: First Trust IPOX-100 Index Fund (NYSE: FPX). What makes this one of the best ETFs to buy is that it is a great "twofer." Because it's a fund that owns about 100 stocks covering the broad market, you get a combination of hot new tech stocks along with great diversification.